The snow is finally gone and fresh new grass is emerging. The heavy rains in the last few days are a blessing not only for the west country, but also for the creatures that call this land home. The new grass will definitely come quickly now. These two young bachelors we found while riding way back in one of the valleys. Their winter coats have been shed out and they are quickly putting on weight as this new forage emerges. One day we had hauled our horses out west to go for a ride in wild horse country and at the location we picked to park we were met by an old friend, “Socks”. Not too concerned about us, his herd continued to feed while we unloaded our horses. 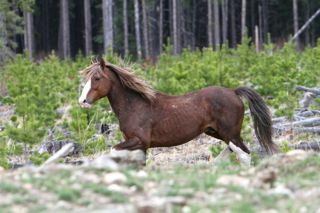 Upon seeing our mounts, the boy put on quite a show prancing back and forth between us and his herd. It is so great to see him in such excellent shape. His herd now has two young foals who are both doing well. In our travels we are starting to see some of the young bachelor studs confronting the herd stallions in an effort to start their own herds, by stealing a mare or two. Sometimes, if they are strong enough they can dominate the old stallion, chase him off and take over the herd. This light coloured stallion, confronts a young upstart who got too close to his herd, which watches on. In almost all cases that we have observed these battles are more bluff and noise than truly physical. 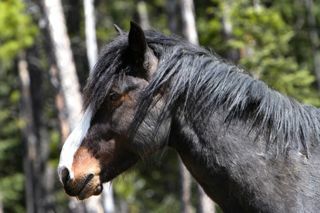 Unlike wild horses in other areas, it seems that our Alberta wild horses have enough room in their territories that the battles do not have to go the extreme that sometimes TV portrays. This battle was very quick with the young boy being thwarted in his attempt. We did see him a week later where he had managed to pick up a mare from another herd and he had his hoofs full trying to protect her from the advances of another young stud. A few weeks before however, these two boys had been together. 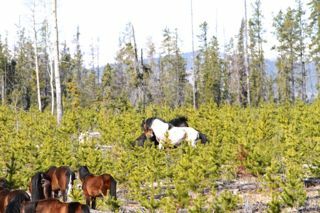 When you spend a lot of time observing the wild horses, you always come across other wildlife that inhabits our Eastern slopes. As much as I enjoy researching and photographing the horses, it is always educational and entertaining to study the antics and behaviour of these other creatures too. 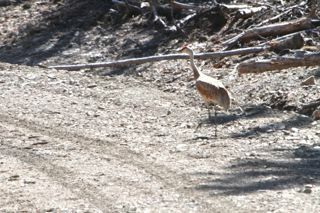 The last time out close to muskeg meadow, we came across a pair of Sandhill Cranes who were taking a stroll down a logging road. I believe that this is same pair that has nested in these meadows for several years in a row as they do mate for life. Their calls through the forest are haunting and unique compared to other sounds that we hear. 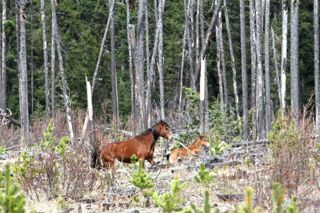 Interest continues in the welfare of our Alberta wild horses in the last two weeks. 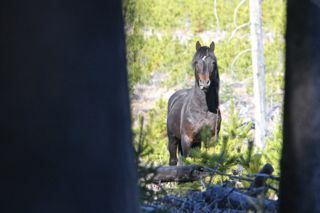 We have given interviews to two Canadian horse magazines and a magazine writer from Switzerland about the wild horses. 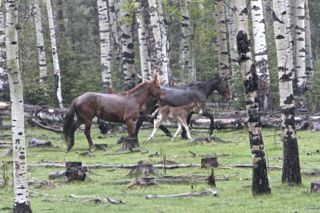 Then one rainy Thursday we also took a film crew from the Arab TV news network, Aljazeera, who are doing a documentary on Canada and wanted to include a segment about our Alberta wild horses. It was amazing how close the wild horses allowed their cameraman to approach, which enabled him to get some spectacular footage. 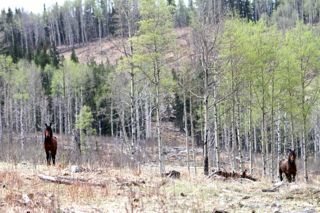 All this is very positive in drawing more public attention to the fact that here in Alberta we are privileged to have these beautiful and magnificent horses roaming free and wild.